This spring, Bauer Hockey will refresh their Supreme line of goalie gear and introduce the new Bauer Supreme S29 catch glove. The new Bauer Supreme S29 catch glove is a performance level catcher that will get you great materials and exceptional performance while saving a bit of money over the top of the line model. Key upgrades for the Bauer Supreme S29 catch glove over its predecessor (S190) include a new split T design, new max depth pocket, and new upgraded synthetic material. They will also be offering the S29 catch glove in new intermediate optimized dimensions. Getting into some additional features and technology, we’ll find that the Bauer Supreme S29 catch glove comes with a full hand closure break. As mentioned above, an all-new Split T is used as well. Along the cuff of the Bauer Supreme S29 catch glove, you’ll find a one-piece cuff design with a free flex backhand. There will also be a Thermo Max liner used inside the glove for quick drying and moisture wicking properties so your hand stays dry throughout the game. For protection, the Bauer Supreme S29 catch glove offers HD foam around the perimeter. Bauer’s Game-ready pro palm is also used to enhance the S29 catch glove. 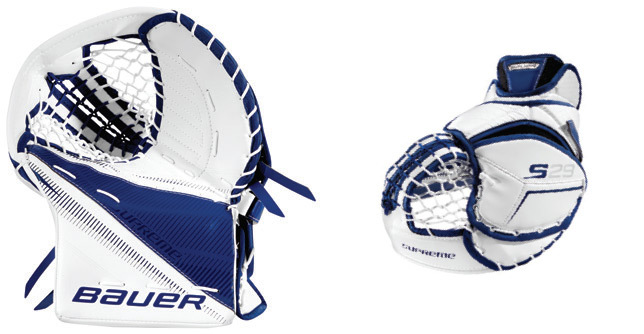 The Bauer Supreme S29 catch glove will come in both senior and intermediate sizing. Both will be available with regular and full right setups, however, only the full right will only come in a white/white colorway. Regular setups will be available in white/white, white/red, white/navy, white/black, and white/blue. Expect the new Bauer Supreme S29 catch glove to launch this spring. Keep an eye out on our site for more details, and be sure to check out our friends at IceWarehouse.com for the best deal and free shipping on your order when the new gear arrives!